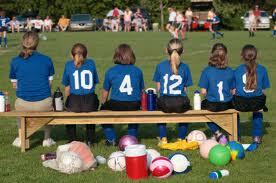 Do you know what is appropriate for U10 teams? At this age, boys and girls begin to develop separately (with girls often developmentally ahead of boys). Their ability to stay physically active is increased from U8. Gross and small motor skills are becoming more refined. [Gross motor skills are bigger movements—such as rolling over and sitting—that use the large muscles in the arms, legs, torso, and feet. Fine motor skills are smaller movements—such as picking up small object—that use the small muscles of the fingers, toes, etc.] There is a greater diversity in playing ability. The “bigger, faster” kids start to dominate because of their physical maturity. Some children will begin moving from the concrete operational stage to formal operational stage (which means that they are starting to develop the ability to understand abstract concepts). However, the majority of your players will not be developmentally ready to implement “possession” soccer or playing an “offside trap.” Most of your players will still be thinking about things very concretely (literally); for example, there’s the ball, I should go over and get it – hence, “the pack.” Nevertheless, some players will start to understand some fundamental tactical concepts, such as changing the direction of the ball (e.g. to the “weak side”). They are starting to demonstrate increased responsibility (e.g. carrying “own stuff,” tucking in jersey, tying own shoelaces). Continued positive reinforcement needed. They are becoming more serious about “their play” and they may initiate play on their own (e.g. set up their own game, practice moves they learned during practice on their own). Peer pressure is still very significant – they still want to be liked by their teammates. Team identification is important and they are starting to become more team-oriented. An adult outside of the family (e.g. you, the coach) may take on added significance. 1v1 attacking should continue to be heavily emphasized, while 1v1 defending can be introduced (try not to confuse the two, though; e.g. do an activity for 1v1 attacking, then do an activity for 1v1 defending. It can be the same activity, but make it clear the focus has changed). Continue to have the players juggle at every available opportunity (before/after practice and during breaks in the session). Introduce players to shielding the ball, as well as some crossing and finishing (in the flow of games). Many sources advocate for teaching “headers” (heading the ball) at this age; however, outside of some very basic “throw the ball up to myself and head it,” I would wait until the players are a bit older. With all of the research that is coming out on concussions, I would advise against spending time on headers and do not berate a child at this age for not heading a ball during practice or a game. It is now appropriate to introduce (do not expect competence or mastery!) limited attacking principles (e.g. add support, width, and creativity to penetration, or “to the left/right/behind of the pack”). Introduce the idea of possession (do not expect more than 3-5 passes at most) and remember that the majority of your players are still very concrete in their thinking – is the goal to get passes or score goals? Try not to confuse them. Introduce some limited defending principles (e.g. pressure and delay). You will have a hard time telling a player not to try win the ball if (s)he is that way inclined; similarly, it will be difficult to tell a player not inclined to “tackling” to change his/her mind. This will come in time (hopefully! ).